Brian Kolfage is an epitome of a true American hero with a never-say-die spirit to the vicissitudes of life. He has been through thick and thin but still wears a smile whenever you see him. Kolfage is a United States Airforce veteran, a triple amputee and the most severely wounded airman ever known in history. He is also the first injured victim to have received the fastest medevac from a war zone to the United States. His life turned around in Balad, Iraq, on September 11, 2004, in an unfortunate circumstance where he lost 3 of his limbs. However, the loss marked a new beginning in Kolfage’s life; career, relationship and the general perception of the public about who he is. This was the same man who at a time was very close to death. Today, he still lives and is ever bubbly with life. Here is everything you need to know about this war veteran starting with his childhood life. Brian Kolfage was born in Detroit in Michigan on September 21, 1982. He lived his early years in Detroit before he relocated to Waikiki, Hawaii to live with his mother following her separation from his dad when he was 13. Brian spent the rest of his teenage years in Hawaii and it was from there that he joined the United States Air Force in 2001. His military service began with his stationing at the Goodfellow Air Force Base with the 17th Security Forces Squadron. In the course of time, Brian got deployed to serve in Kuwait in 2003 after which his 2nd deployment came in 2004. He was deployed to serve in Balad Air Base in Iraq. While there, on the afternoon of 11th of September 2004, a 107mm rocket shell exploded 3 feet from where Kolfage had gone to go get some water. 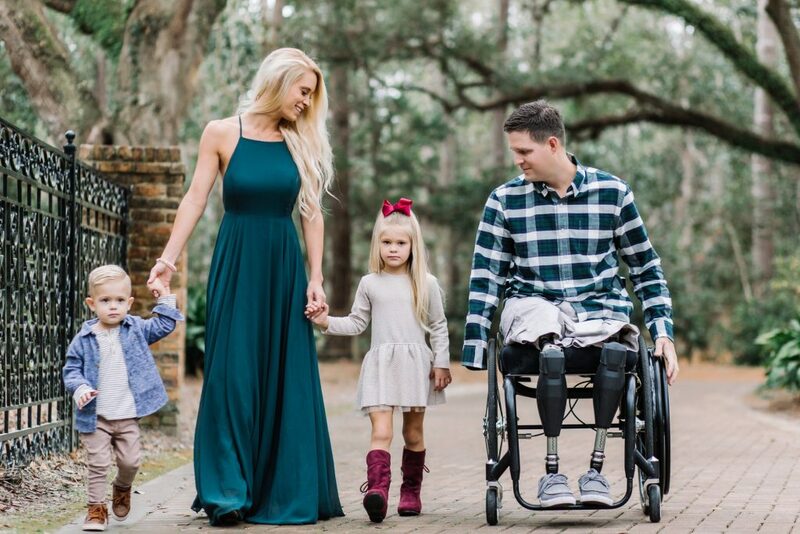 That became the last day Airman Brian Kolfage made use of his two legs and right hand. He sustained life-threatening injuries, the impact of the explosion on him was so severe that it threw him several feet into the air before he landed on a wall of sandbags. Still conscious but very close to death, he mustered the strength to quickly call out for help which was quick to come from fellow Airmen in the closest tent. Kolfage described the pain he felt like the worst ever, from his knee down felt liquified and he thought there was a huge chance he will die any moment. Brian couldn’t be administered any pain medicine because he lost so much blood and any pain medicine administered on him will quickly kill him. The camp hospital had to get blood from over 100 hundred blood donors to keep him alive. Once he got stabilized, he was transferred to Walter Reed National Military Medical Center 36 hours after the attack. He was put under an induced medical coma for 4 days. Two months later, he got discharged from the hospital and began an 11 months journey of rehabilitation which also came with follow up surgeries. After he recovered, he had to move on with life and decided to relocate to Tuscon city in Arizona. There, he got a non-military job at Davis-Monthan Air Force Base as a base security manager. Brian Kolfage worked 2 years in the Airforce facility and was still determined to get more out of life, he enrolled at the University of Arizona to study architecture with support from the Pat Tillman Foundation. He graduated from the school with a degree in 2014 but while he was there, he reconnected with his high school crush. Brian Kolfage reconnected with Ashley Goetz now Ashley Kolfage on Facebook. Ashley had just graduated from college and was in Texas. He chatted her up on Facebook and they rekindled their friendship. When Ashley flew over to see him, she met a man who despite having been through so much pain in life still had a lot of positive outlooks. They both realized that they don’t want to be apart from each other anymore. Two years later, Ashley became Mrs. Kolfage on May 28, 2011, and they each continued their careers in architecture (Brian) and in teaching (Ashley). The duo today, are parents to two kids and are living happily together. Brian Kolfage received a Purple Heart after his injuries which ended his military career. Following his recovery, the former Airman began to speak about his experience and was even a special guest at former President Barrack Obama‘s State of the Union address in 2012. He began a GoFundMe campaign entitled “We The People Will Fund The Wall,” in support of President Donal Trump‘s United States and Mexico border wall. The campaign had a target of $1 billion and within 3 days of its launch, it raised over $9 million. Brian and his family live in a resort-like home built by the Gary Sinise Foundation. Gary Sinise was moved to reach out to him after he heard his story at a Skyball event in 2011. When Gary asked him to apply to the foundation so they can build a home true to his needs, he initially declined, but 2 or 3 years later after they had their first kid, the demands of being a parent began to tell on him considering his condition. He reconsidered Gary’s offer and by 2016, they moved into their new spacious home.